John Tortorella had one thing on his mind Sunday afternoon in preparation for the Pittsburgh Penguins. “We have to stay out of the box.”, Tortorella said. It’s wise advice. When you play one of the élite teams in the NHL, limiting their power-play opportunities is a good start. Turns out the Penguins ended Sunday night’s game with no power plays. You also have to limit their stars. Slowing down Sidney Crosby, Evgeni Malkin and Phil Kessel is of utmost importance if you hope to defeat the Penguins. The Blue Jackets held that trio to just a single point, an assist by Malkin. You’d think given those two scenarios, the Blue Jackets won going away. The final score was 5-2 Penguins. Um, what? Yes. The Penguins had their way early and carried it to victory. Even though the Blue Jackets started getting some opportunities later, they could only muster two goals. That’s simply not good enough, especially for a team who hopes to make the Stanley Cup playoffs. But we have a problem we need to discuss with the Blue Jackets, actually several. How do you limit Crosby, Malkin and Kessel to one point on the night and still allow five goals? There’s a simple answer and there’s a longer answer. The simple answer is that the Penguins have good depth to supplement their stars. It was on full display Sunday night. The longer answer I will go over with you now. We have to start at the top with the Blue Jackets best player. Sergei Bobrovsky had a rough night. Part of that was the Penguins doing a great job of getting in front of the net and deflecting shots. The Blue Jackets could not handle the chaos early in the game. Once they settled down, the Blue Jackets found some momentum and got a goal out of it by Artemi Panarin. It was 2-1 and Columbus had the momentum. Then came the back breaker. Riley Sheahan’s second goal of the first period was a killer. Bobrovsky didn’t look good on the shot. Tortorella said after the game he could tell the bench was deflated after the goal. If you expect to contend for the playoffs and beyond, that’s a shot you have to stop. If you stop it, it’s still 2-1 and who knows what happens. Instead, it’s 3-1 and the Blue Jackets now have to chase the game. The Blue Jackets all said after the game that this isn’t all on Bobrovsky. That’s true. It is a team effort. You still need that save in that situation. 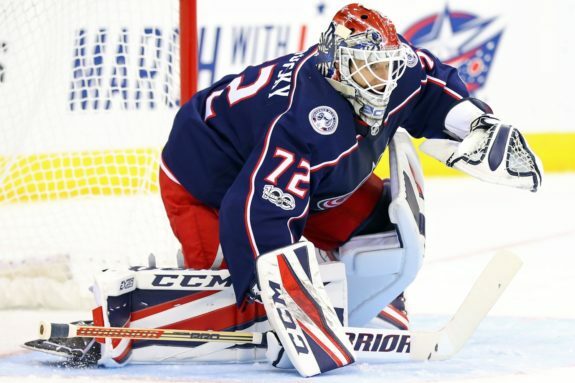 If Columbus hopes to find their way the rest of the season, they need vintage Bobrovsky. The reason for that is the next answer to what gives. This recurring theme keeps haunting the Blue Jackets. Their “core” players are performing far from what’s expected of them. Panarin scored again and is worth every penny to the team. Alexander Wennberg did score to make it 4-2. That was just his sixth goal of the season. We know he’s a pass first player, but he should have a higher number at this point in the season given his new contract. Who is considered the Blue Jackets’ core at this point? Nick Foligno, Brandon Dubinsky, Cam Atkinson and Boone Jenner would be most people’s answer to that at least coming into the year. They have a combined 33 goals this season. Thirty-three. That’s it. They combined for 91 last season. To be fair, injuries have played a major role here. We can’t expect them to have 91 goals when they’ve missed the time they have. But we can expect them to contribute when they are playing. That hasn’t happened to the level that’s needed. Atkinson has eight points in the 11 games since returning from injury. He has 21 points in 43 games one season after scoring 35 goals. 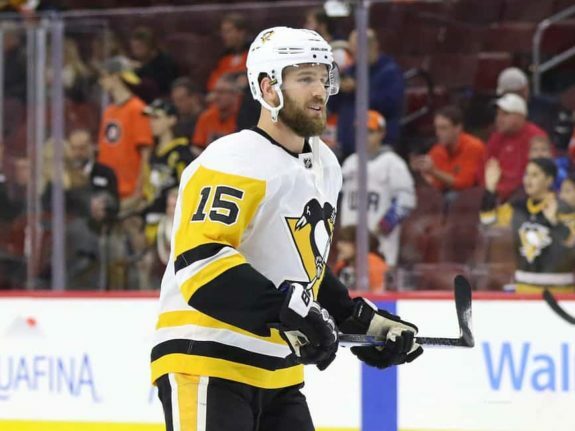 Jenner has 17 points in 52 games which include just five points in 19 games in the 2018 part of the schedule. He is a former 30-goal scorer. Dubinsky has just three points in the 10 games since returning from injury and has just 15 points in 41 games on the season. He’s on pace for his lowest offensive output of his career. This is scary stuff if you’re a Blue Jackets fan. They have some time to figure things out, but the window is closing quickly. If they miss the playoffs, this would rank as one of their most disappointing seasons ever given the level of expectations placed on the team. It comes down to their core players. If they play like they can, they’ll get in. Otherwise, good tee times await at several golf courses. Take one look at who scored for the Penguins Sunday night. Riley Sheahan scored twice. Brian Dumoulin scored the second goal. Zach Aston-Reese scored the fourth goal. And to top it off, Blue Jacket killer Jake Guentzel got one too. Their depth shined. You want to know why they won back-to-back Cups? Their supporting cast scored timely goals at key moments. Their goaltending got key saves. It all came together as a team for them. 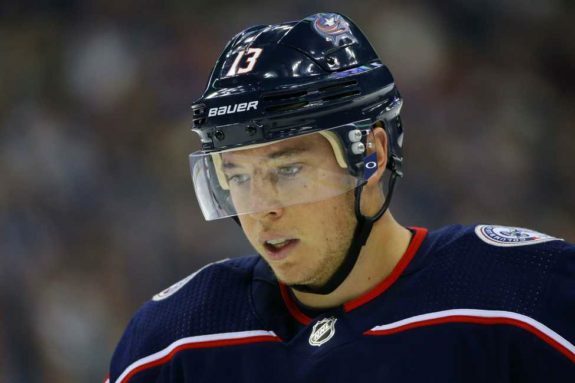 While they are some nice stories on the Blue Jackets, Josh Anderson’s 17 goals, Pierre-Luc Dubois’ rookie season, Seth Jones at times playing like a future Norris winner, Oliver Bjorkstrand showing good signs, the overall depth on this team has not performed to what’s expected of them. Where have the timely goals gone? There haven’t been too many. And I don’t want to hear about the shot totals. Yes the Blue Jackets lead the league in shots on goal. They’re dead last in shooting percentage. That’s not all luck. There is some merit to these results and it’s concerning. Want to know why the Penguins are where they are and the Blue Jackets are where they are? 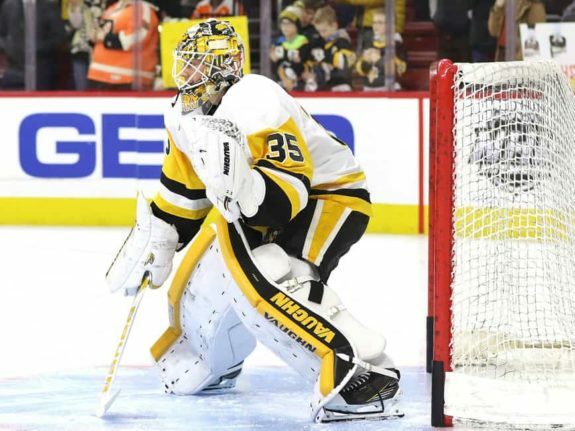 Their cores, their depth and their overall goaltending tell the story. Tristan Jarry made it look easy against the Blue Jackets Sunday night. The Blue Jackets simply don’t have the depth that top contenders have. The Penguins scoring five times without their stars involved says everything you need to know about the state of the team. As somber as this is, it is not too late. The Blue Jackets sit just one point out of the second wildcard as of this writing. They have New Jersey and Philadelphia this week. If they win both games, they’re right in the race. Can they somehow find a way to figure this thing out before it’s too late? Even if they do, they fall drastically short of the top contenders. Sunday night put that on full display for us. We’re going to learn a lot of things about a lot of people, from players to coaches to management. Will they stay the current course? Will changes come in form of trades or other moves? Bottom line is they need to do something. What’s happening now is simply not working. Will they acknowledge it at some point? We’ll see.